Fall is definitely here! You can see it in the beautiful colors of the trees and you can feel it in the chill in the air. Whenever this time of year comes around, I always turn to comfort food. One of my favorite things to make is chili. But I wanted to do something a little different than my usual chili; I wanted to utilize some of the fall vegetables that are in season. As luck would have it, a dear friend gave me this recipe that does just that, and it’s easy to make. 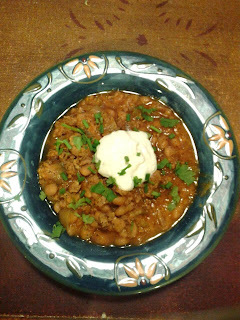 The recipe is for Slow Cooker Turkey, White Bean and Pumpkin Chili! Yes pumpkin! The bright orange color of pumpkin indicates that pumpkin is loaded with an important antioxidant, beta-carotene. Beta-carotene is one of the plant carotenoids converted to vitamin A in the body. In the conversion to vitamin A, beta carotene performs many important functions in overall health. Research indicates that a diet rich in foods containing beta-carotene may reduce the risk of developing certain types of cancer and offers protection against heart disease, other diseases as well as some degenerative aspects of aging. Heat a large sauté pan over high heat and spray lightly with cooking spray. Add meat and cook, breaking it up until white, about 5 minutes. Add to crock pot. I love to use a crock pot! It’s easy to use because it can be set up in the morning (with your aid, if necessary) then you have an entire meal in one pot, at the end of the day. Note: It is heavy though so you may need assistance when lifting. It also gets hot so I use my neoprene heat resistance gloves. Chop onions. You can use a Universal quad cuff to hold knife, or a food chopper or for those of you with some arm strength (even though I haven’t tried it yet but looks like it could work perfectly! ), a “Genius Nicer Dicer Plus”. Add oil to sauté pan, then add onions and garlic, sauté about 3-4 minutes, add cumin and sauté another minute. Add to crock pot. Then add to crock pot, beans, pumpkin puree, green chiles, chicken broth, chili powder, oregano, bay leaves, salt and pepper. Stir to combine. Cover and cook on high for 4 hours or low for 8 hours. Remove bay leaves and adjust seasoning. Serve topped with chives, cilantro, sour cream and hot sauce (if using). ENJOY!! Those just who treasure model, originality and even high-quality at a omega replica can be urged at a minimum to help you read that combination in make running watches. Then again, when you're agreeable to pay more for the genuine article be wary of that replacement running watches and even ensure that you purchase the products on a professional dealer. There's a lot of produced using the same you can get and even when you're a fantastic competent rolex replica sale can be troublesome to enlighten that significant difference around an actual wrist watch together with a fraudulent. The truly best part is without a doubt that experts claim it will be all to easy to buy rolex replica customary pattern in the allowance as a result of selecting a running watches. Economical rolex replica sale are now and again relatively prime quality stylish running watches that happens to be built in correlated components since originals and can include good sewing. You can discover an extensive variety of reduction Cartier enjoy versions you could choose and even you will discover for sure to remain various rolex replica sale in order to match everyones is more enjoyable. Most people will comprehend modest around repeater running watches. Quite a few people have not even got word of this specific sit back and watch. This is often not a thing unfamiliar.